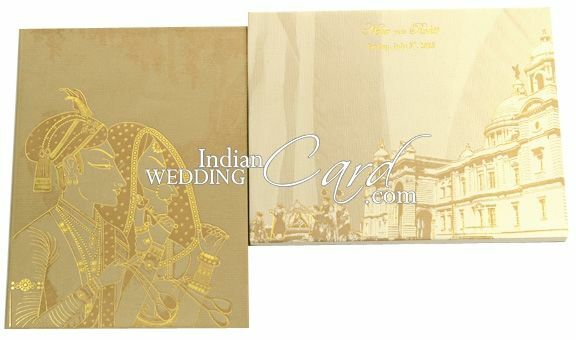 D-6093, Gold Color, Shimmery Finish Paper, Hindu Cards, Designer Multifaith Invitations, Exclusive Invitations. The front of this card has bride and groom design printed in gold hot foil stamping. The inside right holds the inserts. Every insert is in different color as red, green, blue and Orange. It has foil printed plain border all around. 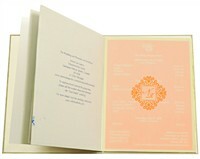 Envelope has a doli printed and palace as background outlined with gold hot foil printing. Hardbound thick card in greenish gold paper. Cream shimmery paper (120gsm) for 4 isilk screen grounded inserts, left of card, right of card and pocket. Every insert has a translucent paper overlay. Printing in any dark color of your choice. Gold hot foil printing possible at extra cost.